Yoga is a system, not of beliefs, but of techniques and guidance for enriched living. Asana (poses) practice is one of these forms because through moving the body and breathing, the body settles, so the mind can follow suit. The physical practice of yoga also creates awareness to how one moves on the mat and off the mat. This awareness begins to create subtle changes in our lives. We offer regular classes to suit your ability. Acupuncture is an ancient Eastern Medicine thousands of years old that promotes health and balance within the body. There are several energetic pathways that carry qi (vital energy), fluids and blood to all areas of the body. When a pathway is blocked because of trauma, age, injury, or habits, the qi and blood do not access all areas, resulting in pain or illness. The insertion of needles in specific points along the pathways correct the imbalances and treat the root cause of symptoms. Crystals have been used in healing for 1000s of years. The molecular structure of the crystals is very stable which entrains the less stable energy of humans to resonate on the same frequency, thus restoring balance. This also occurs due to the color and/or chemical makeup of a crystal. For example, stones containing Lithium help one to calm down. A blue stone can also have the same calming affect. 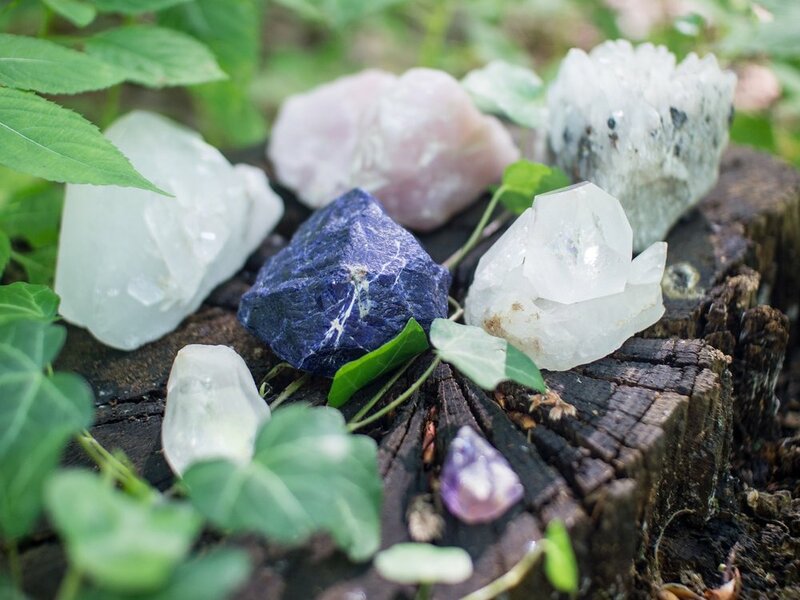 Crystal Healing can be a treatment on its own for grounding, chakra balancing or rebalancing the body. This can also be an adjunct to an Acupuncture treatment. Yoga Nidra is known to many as Yogic Sleep or Sleeping on a Cloud of Yoga. It is a guided meditation that leads the practitioner though 61 points in the body while laying down. This allows one to enter a state of deep rest. During this practice, the most dominant brainwaves are Delta Waves. At this frequency, external awareness is suspended and one enters a state of healing and regeneration. Yoga Nidra offers one important time to relax one's mind and repair their bodies from stress, fatigue or imbalances. Myofascial Release can be a private session or an adjunct to a private yoga session. The myofascia is made of collage fibers and can be found at several layers: it lays under the skin, envelops each muscle and each muscle fiber. It holds the lymph system and many nerve receptors. Myofascial can become tight due to overuse, injuries, trauma or inactivity. When this happens the muscles do not move as fluidly as they should leading to restricted range of motion or pain in the muscles and joints. To release the myofascia, we will work with myofascial balls to breakup collagen fibers in order to create a new matrix that will allow the muscles to have full range of motion. This can relieve pain in the joints. Motor Point Therapy strengthens weak muscles and relaxes tight ones. A needle is inserted into the muscle belly where the nerve enters the muscle and is gently stimulated until a twitch response occurs. This causes the nerve and muscle to reset. So that a muscle that is not firing could contract, thereby increasing its strength, and a muscle that is constricted from overuse to relax. It is important that muscles know how fire and release. An overly used muscle will cause the fibers to be in constant contraction leading to the muscle to shorten eventually putting strain on the tendons and joints. This will cause pain and dysfunction in the muscles and joints. A weak muscle will cause other muscles to work harder just to maintain balance in body, also resulting in pain and dysfunction. In your individual Yoga Assessment Ana will perform a series of tests to evaluate muscle strength and weakness. The results will determine the yoga poses to engage weak muscles and poses to release tight ones. This is an invaluable service that will help you understand the limitations in your body and allow you to work through them. The focus of this session can be on either the hips, shoulders of focused on a particular pose. Functional Medicine is an all systems biology approach to treating chronic illnesses. It focuses on getting to the root cause of a person's symptoms by delving into one's personal health history, diet/nutrition, lifestyle, environment, genetics and family health history. Functional Medicine asks how and why an illness occurs. By understanding an illness's pathology - how it began and the progression for a particular individual - one can be prescribed the best treatment for their optimal health. Yoga Team Building - This is a private group yoga class for employees or department co-workers. Several studies show that yoga in this type of setting helps to increase morale, productivity and focus. As well, it improves the health of the employees leading to less absenteeism. This can be a one time offering or a regular class depending upon your business needs. 60 or 90 minute sessions available. Group Private Yoga Class - Wedding Party, Family reunion or Ladies' Night. Yoga is a fun way to connect with these important people in your life. The class helps everyone to relax through breathing and stretching and sets the mood for the rest of the day of fun, laughter and happiness.